Look at this great hat Roberta made. She wanted a cotton hat that avoided intarsia. So she used the 15-stitch logo chart and knitted around in fair isle, adding lice for the carried colors. She knitted the hat from the bottom up (which is also how change happens) but added the border last. 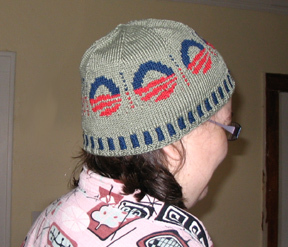 What's particularly fun about this hat is that it's not obvious at first that the design is the Obama logo. People look at her hat and say, "Oh, I like your hat . . . oh, oh, wait . . . that's . . . I love it!"